Management systems, communications environment and data center network are getting more and more complicated. Changes in the business world have created the need to manage servers, mainframes, computers and applications in heterogenic and geographically distributed systems. In order to optimize the availability and performance of network infrastructure, constant monitoring is required over the mainframes, TCP / IP, WAN, LAN, switches, routers and other infrastructure components that identify failures. This in order to identify failures and malfunctions before the infrastructure is damaged. Network administrators are required to follow bandwidth utilization and immediately re-establish the damaged resources and prepare for growth. VIP Communications Monitor of the American company SDS allows you to handle the communications and the services around them. The system allows proactive response to malfunctions, performance and resource management for all corporate IT infrastructure. With VIP Monitor, your IT managers will have real-time tools to understand and identify any fault that occurs in the system and to take corrective action before it will affect the production, work and income. With VIP tools, the IT staff can prevent falls and breaks before they occur, improve repair time and monitor and measure the resources that require re-establishment. Small IT staff contributes to profits, efficiency and good service. The VIP system documents service levels for different target markets and enables IT management that includes resources distribution. It will allow monitoring of business transfers, application troubleshooting in various levels and comparisons between real-time and history. In short, VIP system will bring significant savings to the organization and high return on investment in a short time. This document will help you understand and quantify your expectations for ROI in implementing VIP Monitor. To calculate the business benefits of monitoring and securing with VIP service, the organization should identify the costs, profits and specific IT processes that require resources and personnel before implementing SDS VIP system. 1. Add productivity and income that will evolve from applying the solution and reduce expenses. In the case of VIP system, productivity is gained from end-users who receive a faster and more reliable network, savings are gained from IT staff that is more efficient and you can expect more profits by improving customer service. 2. Reduce the cost of the acquisition and integration of the solution including training and maintenance and calculate the opportunity created by not investing elsewhere. 3. Calculate the return on investment from procurement – usually for three years. The result: Fast ROI - return on investment. Monitoring in the past was simply to know whether the system works or not. But if the system, communications, network or applications are disabled, it costs too much. When there is a large number of users in the system, downtime or slowdown in activity can amount to millions of dollars. VIP system is proactive, meaning the IT staff can identify problems before they affect the employees. Moreover, the IT staff will be able to prevent the downtime. When it is impossible to avoid downtime, the IT staff can shorten it. IT staff will respond faster to malfunctions. VIP users report that repair time is reduced by half. Less downtime and faster service allow increased productivity of the users. If your data center increases productivity in 5 % to 10 %, which is a reasonable and expected result, your company will see a quick return on investment. 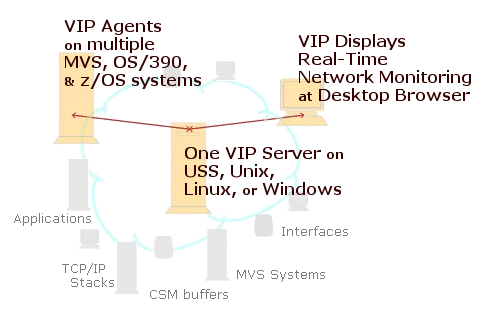 VIP System software is intuitive, integrative and user-friendly. The IT staff will have a scalable system, unified, easy to install and quick to learn. Their work will be more effective. With VIP system the IT staff can see all of the network and corporate infrastructure - servers, Mainframes, networks and applications from a single point-of-view. This means that the entire system can be monitored with less people. Since VIP enables a more reliable network run, the IT staff won´t receive as much calls for service and support, will travel less to sites and the assistance from outside consultants will be reduced. VIP system will reduce the number of bugs that need to "climb the organizational ladder" to employees with higher wages. Each team will have a better understanding of the system from end to end so that junior staff members will be able to handle problems, detect faults and solve them. Releasing IT resources will allow a faster assignment of IT employees to other installations and tasks and will improve the efficiency and competition. VIP system accurately reports on directions and plans that will allow the IT staff to adapt the network. Such network uses resources optimally, efficiently and needs less manpower, software or new hardware. With VIP you can run a faster and more reliable network. The IT staff will respond faster to customers and there will be less fines for slow performance, less calls for fault reporting or deductions. In addition, VIP provides the necessary accurate information to document network performance for the SLA service agreement. This means that the IT improvements will not be lost in the organization´s payments from business customers. Proceeds from these sources will prevail. Efficiency of the IT staff can be measured in several ways: servers, mainframes, routers and number of users in relation to the number of IT professionals. Quantifying changes in output and IT staff efficiency: calculate the time saved or paid in full salaries. Quantifying downtime costs: calculate downtime hours with number of employees affected and their salary costs, or double the downtime hours with the average income of a paying customer.
" Loss of opportunity" includes the present value of purchasing the software, ie the amount you could have received as an investment with a yield of 5%. VIP launch will help you create added value and save costs by preventing downtimes and minimizing the impact on users. It will help you increase the efficiency and improve IT staff´s efficiency and network resources. Your organization will be able to increase profits by SLA Service that is monitored and controlled. This savings and extra revenues can help you get return on investment in a short time so you can get a refund and enjoy the software and its fruits for a long time.